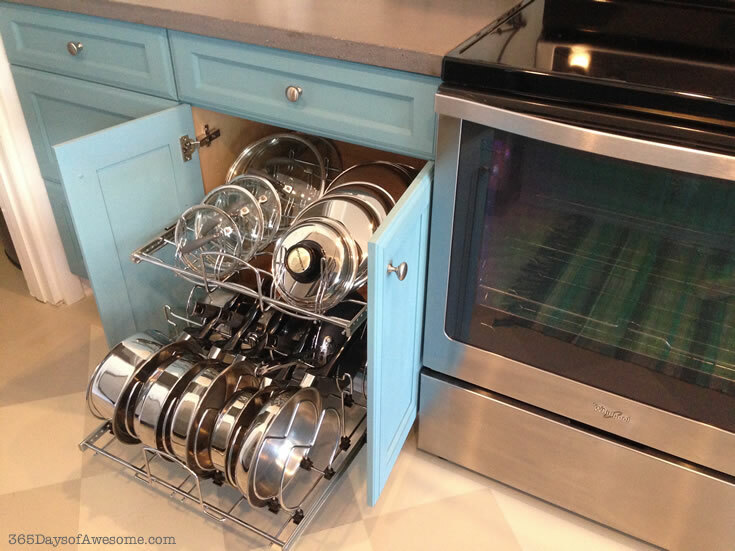 How I rethunk my kitchen and made it easy to use and AWESOME. I used to think I was doomed to be a slob. Turns out I was just hopelessly disorganized. 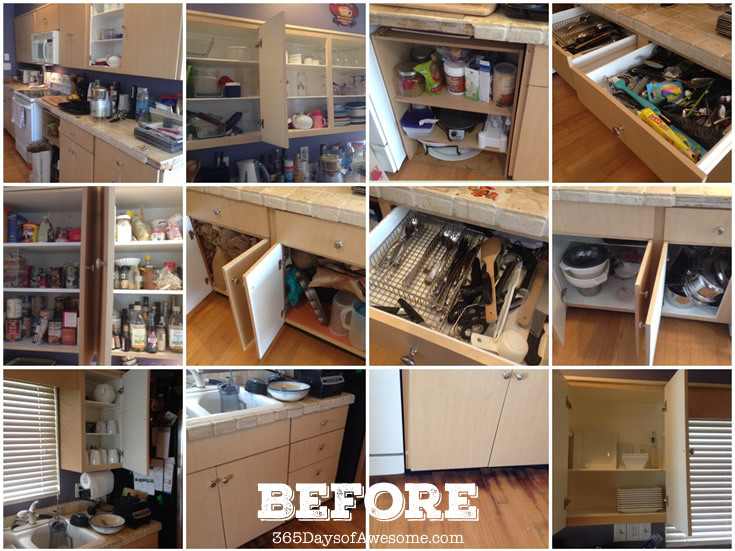 When I returned from a two month trip to Germany, I had a chance to look at my kitchen with a brand new set of eyes: it was a mess, disorganized, falling apart, and I hated doing anything in it. Out of necessity, I needed to eat healthy, home-cooked foods. My life literally depended on it. But I didn’t want to cook, and I definitely didn’t want to cook anything in THAT kitchen. That’s when I took a step back and looked at exactly why I hated my kitchen so much. 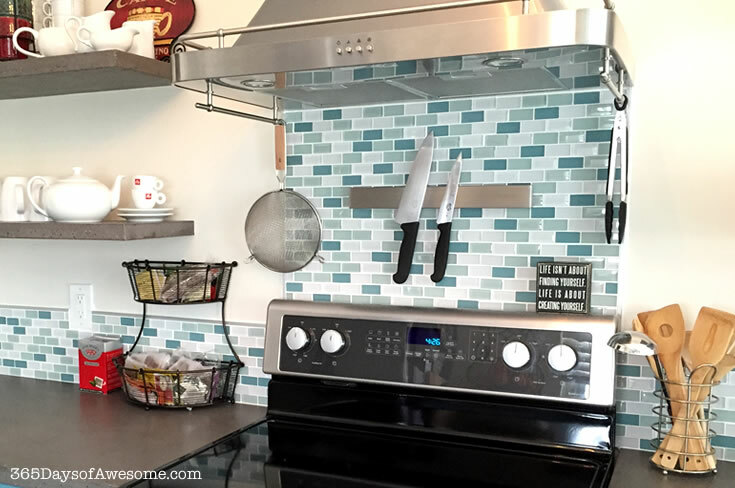 It was more than just the loose tiles that kept falling off my counters. It wasn’t just the cupboards that were literally coming off their hinges. No. It was something more. Then it hit me: I had never ever learned how to USE a kitchen. See, my mom was a single mom for most of my life. She was an actress and did other things in LA. She is a great mom, but an apron-sporting-scratch-made meal-making sort of mom, she was not. Neither was my grandmother for that matter. So, with all that experience under my belt, I married my husband when I was just 18 years old. We got our first apartment together, and it had a kitchen. 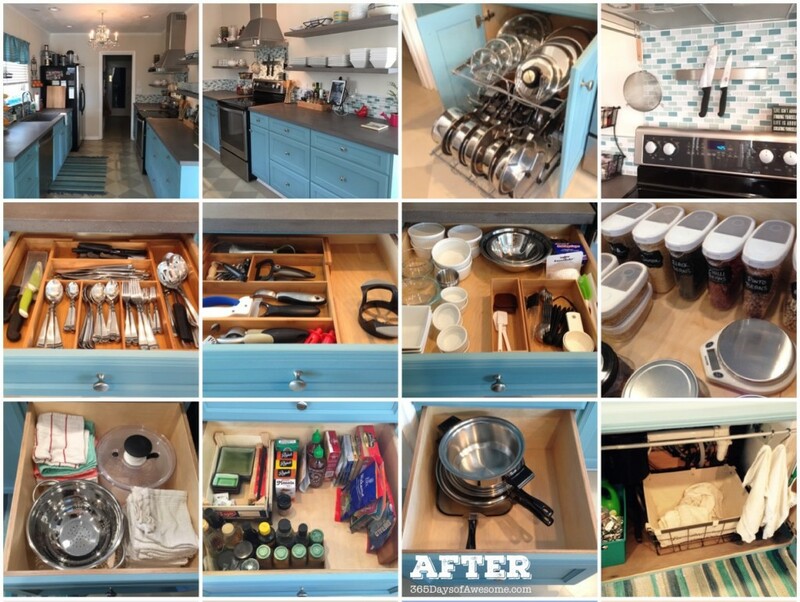 So, like good adults, we filled the cupboards and drawers with kitchen stuff; gadgets and gizmos, plates and bowls. Big spoons and spices and other kitchenly basics we had no idea what to do with. Then, over the next two decades, we moved close to a dozen times, hauling all that stuff with us from house to house. I crammed things in cupboards with no thought to how I would use them. It had never in all those years occurred to me that I had no idea what half those gadgets were for, or even how or when to use half of what made up my kitchen and pantry. No, I just blindly acquired what I thought you were supposed to have in a kitchen and then I stored it wherever. For years. I was going to gut this sucker and build a real kitchen that I would not only know how to use, but LOVE using. So, I got to work and started rethinking everything about the kitchen. I decided that conventional ideas of how to use a kitchen were not necessary to my kitchen planning either. I didn’t have to have specific cupboards for this, or store this like that just because other people did it like that. No. I could do whatever the hell I wanted because it was my kitchen. I knew there were other, even more efficient means of managing a kitchen, and I was going to make that a key to my kitchen remodel. Look at everything I have in my kitchen and determine whether I need it, will use it or love it. Whatever I decided to keep MUST have a useful purpose and/or make me happy in some way. I know. Weird criteria, right? In my case, there were things in my kitchen which had been lurking in cupboards for years and years without ever being used. The most love these items got, was being shoved aside to get to something I did use. Those were the things I donated, sold or discarded. That left me with a kitchen full of things I knew I needed, would use, and/or loved. Once I knew what I was working with, I made sure I knew how I would use whatever it was in my day-to-day life. This included appliances, gadgets and thingamajigs. If I had any questions or uncertainty, I took the time to learn how to use it properly so I could think with it in terms of normal food prep. For example (and don’t laugh), I had a food processor, but had no idea how to use it. I knew it would be useful and I loved the idea of it, but I couldn’t even assemble it, never mind process food with it. Well, I turned to YouTube and figured it out. Now I use it regularly. I did this with any of the kitchen appliances and gadgets that I had any questions about. The point was to KNOW how I would use it in my kitchen from then on so I could plan accordingly. After that was all worked out, it was time to design a kitchen that could actually accommodate the points above. 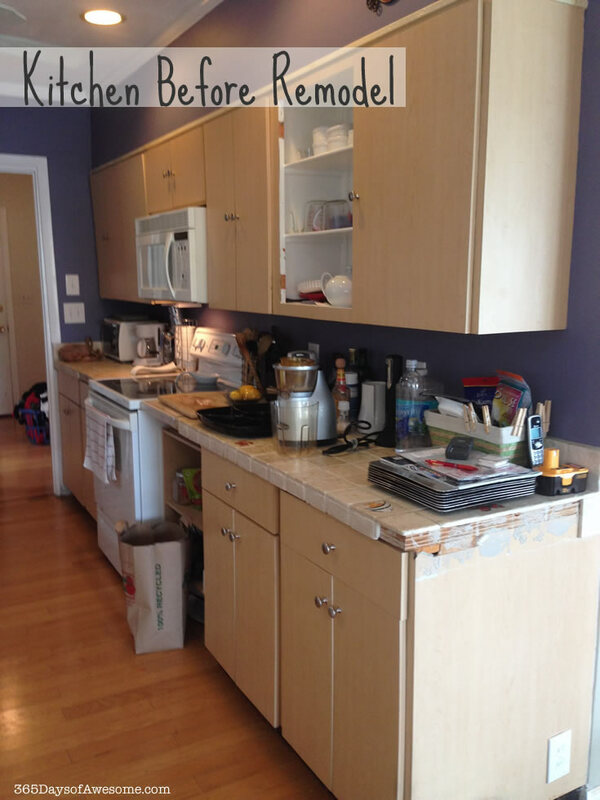 And for the first time, I could design a space which took into consideration how I used everything in my kitchen. I’m almost embarrassed to admit that I actually have successfully run my own company (with employees and everything), and I’m big on creating efficiency in the workflow. I don’t know why I never considered applying that to my home before, but I didn’t. Who uses a kitchen more than anyone? 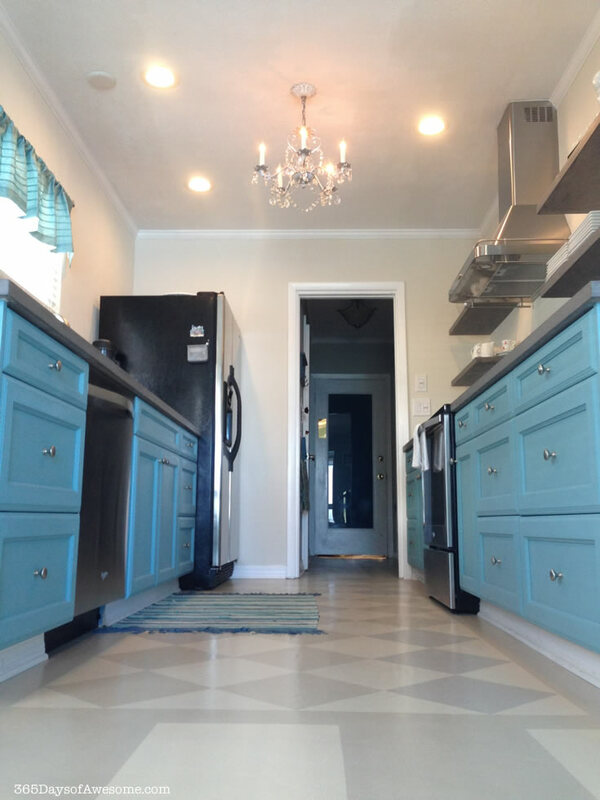 The good ones are all about having a clean, efficient kitchen that is awesome to cook in. So, I started researching how chef’s keep their kitchens. 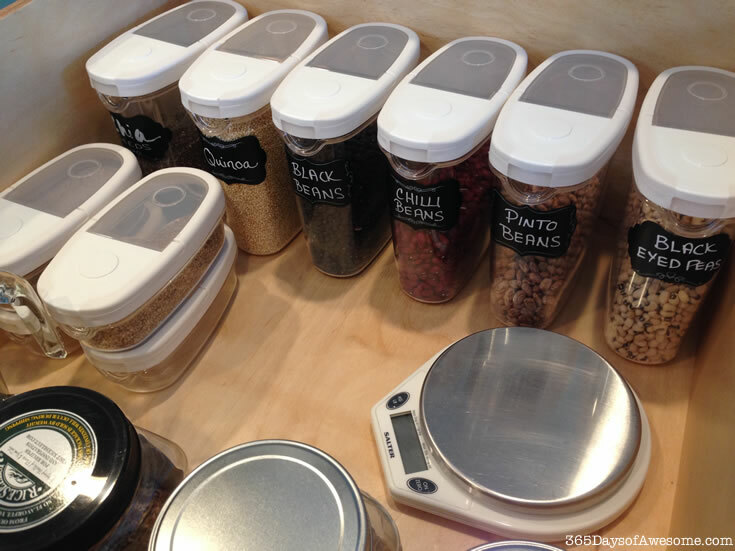 In many professional kitchens, they store their most-used appliances on shelves under their prep counter. Open shelves are essential for ease of access. 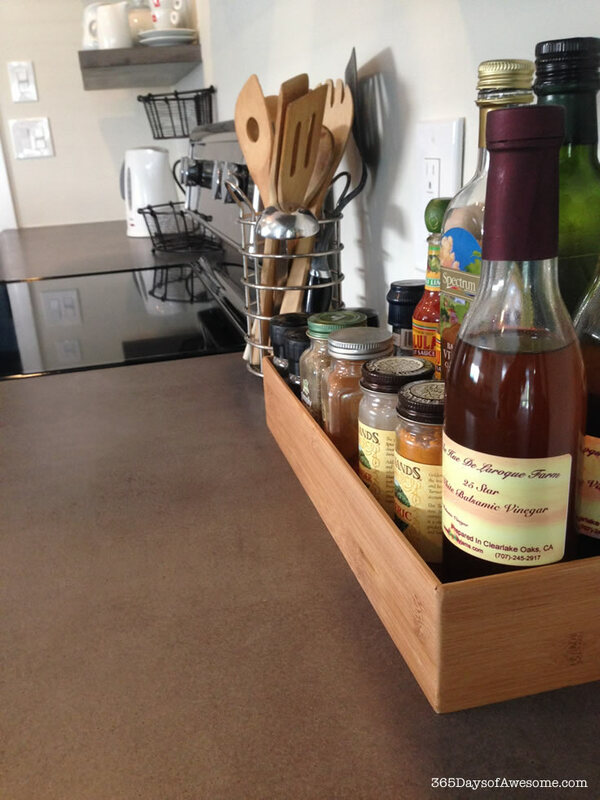 Sinks, cutting boards, spices are all thoughtfully located so the chef can concentrate on just making great food. Once I had a pretty clear idea of what I wanted, I just needed some design inspiration. Thank you, Pinterest! I decided that open shelves were what I really wanted. Having everything within easy reach and visible at a glance makes food prep and plating effortless. And I love having floating shelves. I went with a rail system on the other wall. I wanted my kitchen open, and this system is the ultimate in accessibility. Oils, vinegars, even garlic and lemons, all within easy reach. Instead of lower base cabinets, I opted for drawers. Lots of them. 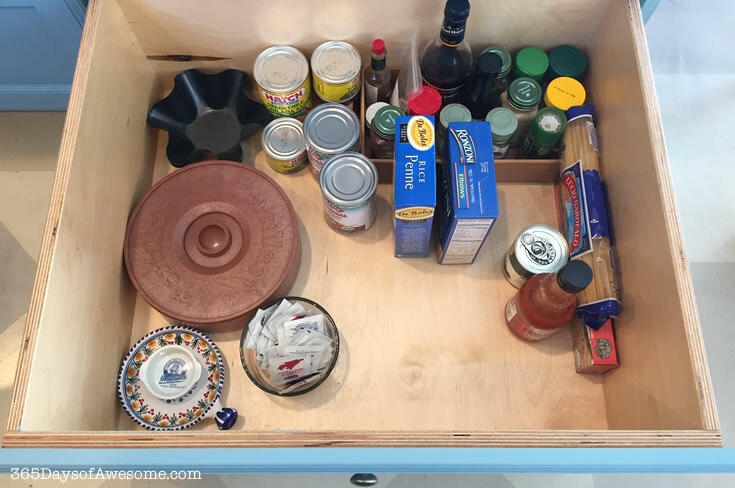 I paid special attention to HOW I make food and the kind of food I make, and I planned my drawers accordingly. Like most kitchens, I keep the spices I use frequently to hand. This tray holds everything we use frequently to make a meal. But other spices are handled differently. I Store Food Prep Ingredients by Ethnic Food Category. 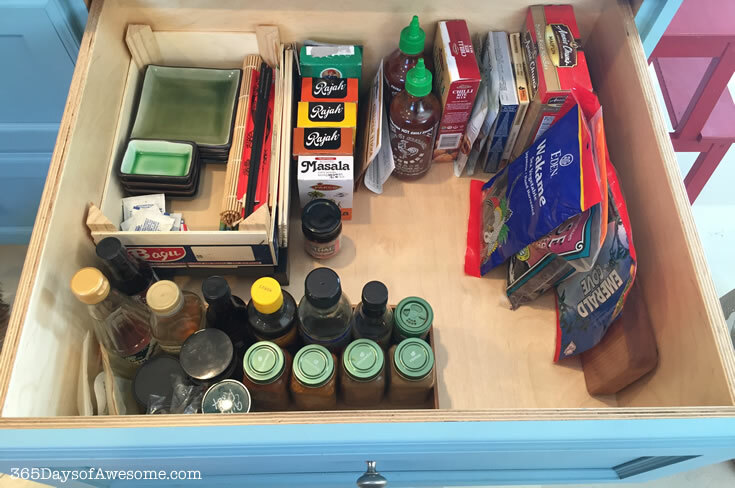 I have a whole drawer that holds EVERYTHING I use to prepare Asian and Indian inspired dishes. My sushi trays and dishes, sauces, spices, chop sticks, nori, rice noodles, etc. Literally everything is in one drawer. Nice and tidy, easy to reach just to the right of my stove. And just below that drawer is another drawer where I keep EVERYTHING I use to make Mexican or Italian dishes. I keep a tray in each drawer with all the spices and condiments, so when I am making a meal which requires them, I just lift out the tray and have everything at my fingertips. When I’m done, it goes right back in the drawer. There are staples that I cook with regularly. I keep these in a drawer neatly labeled and easy to get to. There’s nuts, seeds, liquid measuring cups, a food scale, flour, etc. All right there within arms reach. This is a godsend in my kitchen and never ceases to make my heart feel all fluttery whenever I put my pots and pans away, and it’s right beside the stove for easy access. It was easy to install. All you need is a cabinet. You can get it here on Amazon. 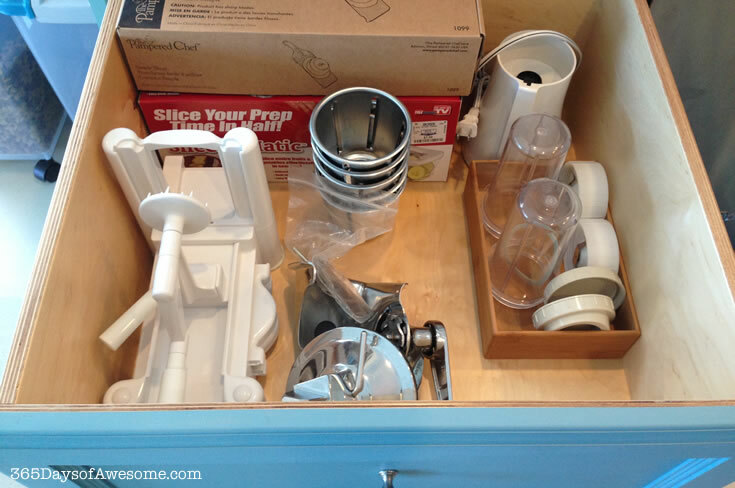 My small kitchen appliances (the ones I use often) are stored in a big drawer where I can reach them while prepping food. I keep my mini-blenders in there, along with my spiralizer, mandolin, etc. All within easy reach. It does not dull my blades (like keeping them in a drawer can). It’s out of reach of little hands. My grandson can reach every drawer and to the back of the counter, but he can not reach these at all. He loves to help in the kitchen and doesn’t care how sharp a knife is. 😯 So I got this. 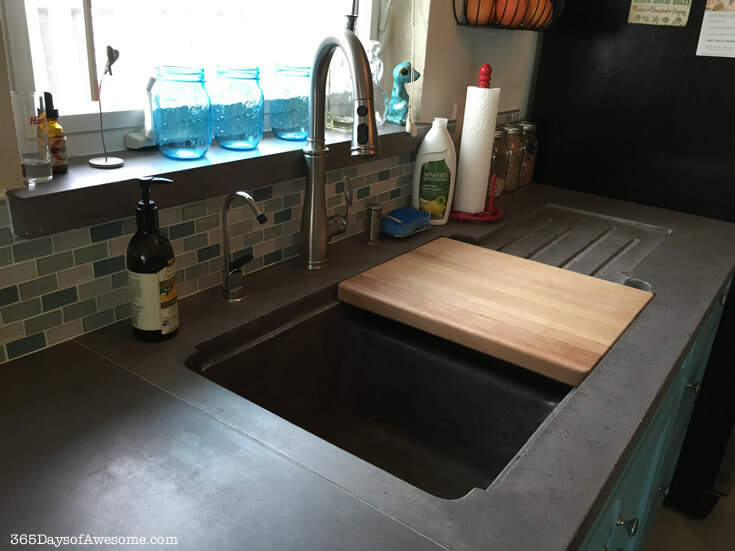 My countertops are poured concrete, with a custom concrete sink and drying tray. Eco-friendly and an awesome food prep surface. And we had grooves added so that my cutting board could sit flush on the sink and be used to prep veggies. It can slide from one sink to the next so that as I cut the veggies, I can drop them into a colander or down the garbage disposal, or just collect the ends in a dish in the sink to be composted. 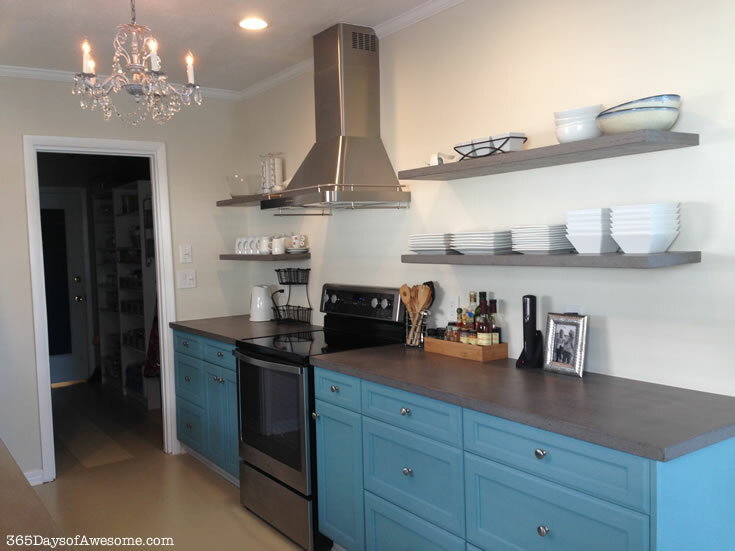 You can read about my whole kitchen makeover and reveal here. The point is that I have a kitchen now that is designed for daily use. Everything has its place and is easily accessible. And for the first time in my life, I actually love cooking. I think this comes from a combination of having a kitchen that’s easy to work with, and knowing what I’m doing in the kitchen (finally). 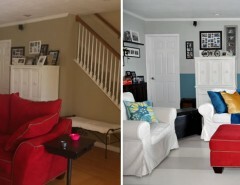 The first part was solved with the remodel. The second was solved when I accepted that I didn’t know what I was doing, and then set out to learn. I read articles, watched videos and made sure I understood what I was learning. Then I started applying what I learned. 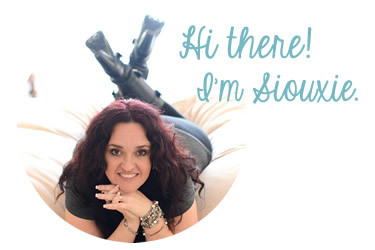 Now I make yummy meals and treats all the time with relative ease–and I enjoy it! 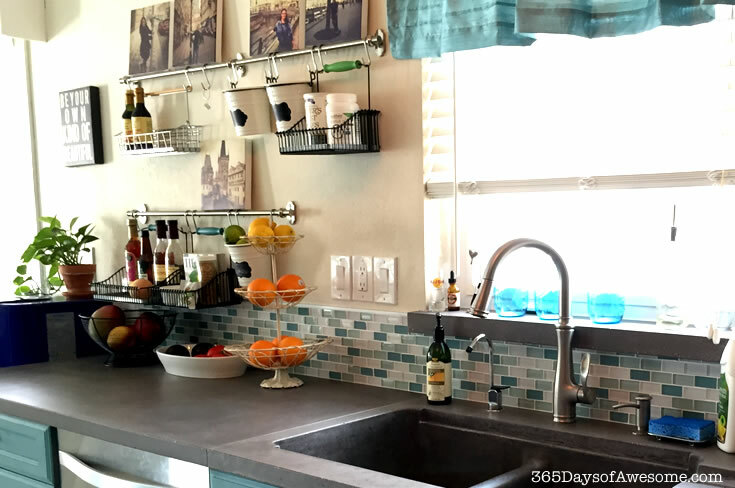 How do you organize your kitchen for maximum daily use? Do you have any tips you can share?